Beautifully engraved Certificate from the Cumberland Telephone and Telegraph Companyissued in 1884. 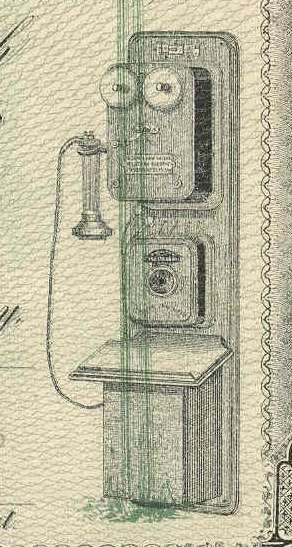 This historic document was printed by the St. Louis Banknote Company and has an ornate border around it with a vignette of of an early wall phone with an underprint of telephone poles. There is also nice silver metallic overprint that says One Hundred Shares. This item is hand signed by the Company's President, E. S. Babcock and Secretary, E. Baker and is over 124 years old. 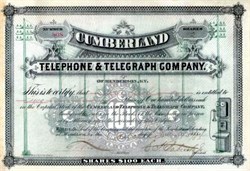 CUMBERLAND TELEPHQHE & TELEGRAPH CO. A corporation formed under the laws of Kentucky, June 8, 1883. The company operates under an exclusive license from the American Bell Telephone Co., its territory comprehending all of Kentucky, Tennessee, Mississippi and Louisiana, and the southern parts of Indiana and Illinois. On January i, 1903, the company had 338 exchanges, with 92,425 subscribers, 11,997 miles of poles and 60,984 miles of toll wires. In 1899 the company acquired control of the Ohio Valley Telephone Co., the territory of which included the city of Louisville. In 1900 the Ohio Valley Co. was merged with this company. A controlling interest in this company is owned by the American Telephone & Telegraph Co. The stock was increased in 1899 from $3,600,000 to $4,500,000, and $500,000 of the increase was used to acquire the control of the Ohio Valley Telephone Co. In January, 1900, the authorized stock was increased to $10,000,000; the holders of the Ohio Valley stock, $550,000, received share for share in the new stock. In 1899 the company increased its stock 25 per cent., giving the stockholders the right to subscribe at par for the increase, and further increases were made in 1900 and 1901, bringing the stock outstanding to the above figures. Another increase of $1,871,280, made in December, 1901, provided that the stockholders subscribing for the new stock should pay for the same in instalments extending to January, 1903. Stock is transferred at the office of the company, Nashville, Tenn., or by the American Loan & Trust Co., Boston. President, James E. Caldwell ; Vice-Pr�sidents, W. W. Berry, William Litterer ; Secretary, Leland Hume ; Treasurer, T. D. Webb ; Auditor, H. Ulair Smith, Nashville, Tenn.
Directors�James E. Caldwell, William Litterer, F. O. Watts, George R. Knox, W. W. Berry, M. J. Smith, V. E. Schwab, W. R. Cole, Nashville, Tenn. ; A. G. Sharp, Atlanta, Ga. ; E. M. Barton, Chicago; W. H. Woolverton, New York ; Frederick P. Fish, Boston. Corporate office, Hopkinsville, Ky.; main office, 180 North College street, Nashville. Annual meeting, first Thursday in February, at Hopkinsville, Ky. The headquarters of Cumberland Telephone and Telegraph were moved to Nashville in 1888 and it was purchased by Southern Bell in 1912, but continued to operate in the name of the Cumberland Telephone and Telegraph until 1926, when its name was changed to Southern Bell.